No persuasion necessary with this bouquet of fresh flowers! 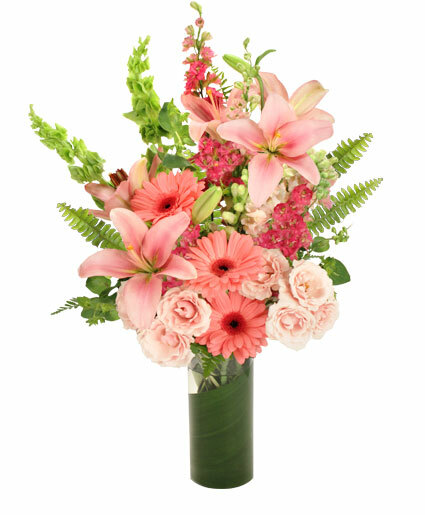 Hot pink gerberas, pink lilies, mini spray roses, larkspur, and snapdragons are complemented with bells of Ireland. Send this arrangement to the special woman in your life! When you order custom designs, they will be produced as closely as possible to the picture. Please remember that each design is custom made. No two arrangements are exactly alike and color and/or variety substitutions of flowers and containers may be necessary. Prices and availability of seasonal flowers may vary. Our professional staff of floral designers are always eager to discuss any special design or product requests. Please call 219-865-1755 to speak with one of our expert designers for custom requests. This double puppy dog basket of flowers is the perfect gift for the dog lover in your family, so adopt the pair today for your special someone! This basket is hand-crafted from fresh cut flowers and accented with bright colorful bows of your choice. This is a fun & flirty gift that gets any dog-lover howling with delight! This arrangement is designed in several different colors and styles based on your special needs. 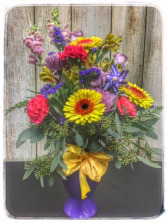 Each design is custom, so please call ahead of time to see what flowers are in season. We are known for going out of our way to make your flowers special. 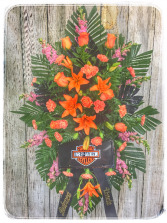 This custom themed sympathy tribute commemorates the passion of life in a very personal arrangement. There are many choices and options available. Our professional staff of floral designers are always eager to discuss any special design or product requests. Call us at the number above and we will be glad to assist you with a special request.